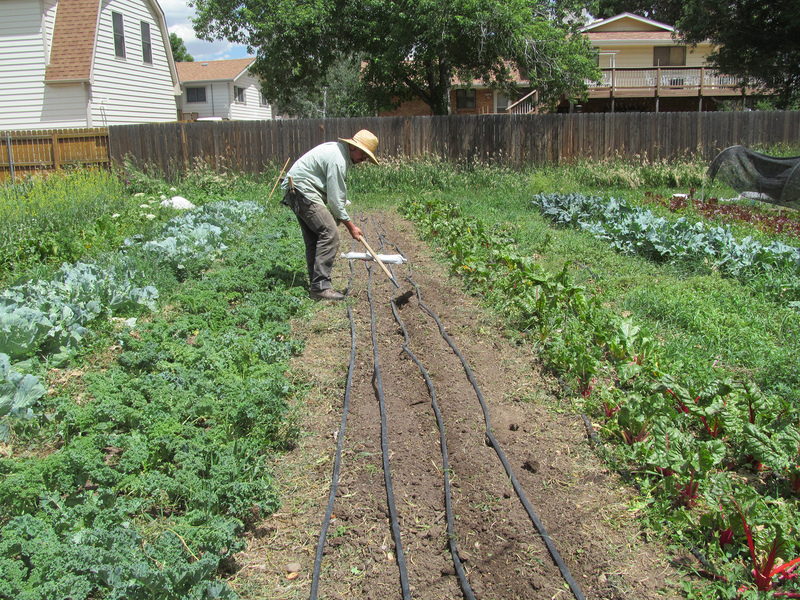 Dan Graeve on his urban farm in Denver, CO.
It’s the week of action leading up to the 2017 People’s Climate March. Farmers are on the front lines of our changing climate, and this week they’re raising their voices. Here is one farmer’s story. By Dan Graeve, True Roots Farm. During the Democratic National Convention in 2008, I set up shop in front of the main convention center and displayed a piece of artwork about climate change. I stood in front of it juggling and rattling off statements about the need for action. Despite getting a pat on the back from Ted Koppel, I can’t be sure how impactful it was. Like a lot of people, I spent a lot of time as a young adult speaking out against an environmentally destructive economy. Also like a lot of people, when I found a job working on an organic farm, everything changed. I have encountered few more transformative experiences than that of becoming part of the awesome biological power of a well-operated vegetable farm—in my case, Gathering Together Farm in Philomath, OR. Fast forward to 2013. With my wife and a couple of friends, I tracked down the owner of a vacant half-acre lot in our Denver neighborhood and managed to sign a two-year lease in order to build an urban farm. Commercial urban farming can offer a rough lesson in the concept of scale of production, especially to the relatively untrained entrepreneur. Now having honed our farm’s efficiencies and design, we’re entering our fifth season. We’re able to continue to operate the farm while maintaining off-farm careers and raising families, which feels like an accomplishment in itself. Urban farms like ours can build community, create beauty, and educate growers and consumers about food. They serve as a model for the home gardener who has the urge to go big. Vital for me, they are a part of a larger movement in agriculture focusing on soil conservation and soil health, which has enormous potential in confronting both the causes and effects of a rapidly changing climate. Food and farming can be effective tools to address climate change. People take food personally, regardless of their politics. As consumers, we face decisions about food more frequently than any other expense. Supporting farms that value a living and diverse agroecology pays dividends. The challenges in transitioning to a more ecologically conscious agricultural system are not unlike other efforts in confronting the climate crisis. Not surprisingly, there are extremely powerful and influential entities who are directly threatened by acknowledging the detrimental public and environmental health effects of an economy dependent on fossil fuels and centralized production and distribution. Choosing regenerative farming as the center of the climate movement allows me to take a positive and honest position that values culture and protects health. I look forward to being one of many farmers marching in the People’s Climate March on April 29th. See you on the front lines.